John Carver is internationally known as the creator of the breakthrough in board leadership called the Policy Governance model and is the best-selling author of Boards ThatMake a Difference (1990, 1997, 2006). He is co-editor (with his wife, Miriam Carver) of the bimonthly periodical Board Leadership, author of over 180 articles published in nine countries, and author or co-author of six books. For over thirty years, he has worked internationally with governing boards, his principal practice being in the United States and Canada. Dr. Carver is an editorial review board member of Corporate Governance: An International Review, adjunct professor in the University of Georgia Institute for Nonprofit Organizations, and formerly adjunct professor in York University’s Schulich School of Business. Miriam Carver is a Policy Governance author and consultant. She has authored or co-authored over forty articles on the Policy Governance model and co-authored three books, including Reinventing Your Board and The Board Member’s Playbook. She has worked with the boards of nonprofit, corporate, governmental, and cooperative organizations on four continents. Ms. 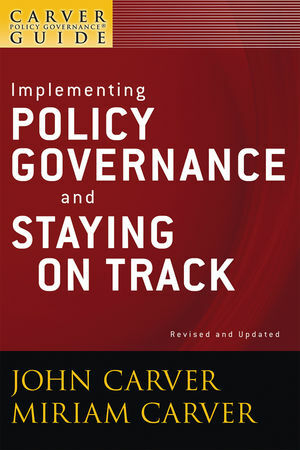 Carver is the co-editor of the bimonthly periodical Board Leadership and, with John Carver, trains consultants in the theory and implementation of Policy Governance in the Policy Governance Academy.